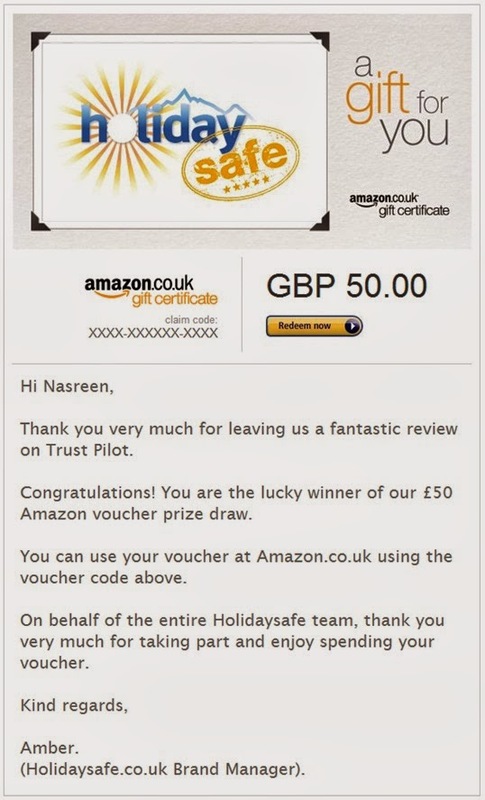 In September we launched our Trust Pilot Competition, which offered customers the chance to win an Amazon voucher in return for a review of their experiences with Holidaysafe on our Trust Pilot Evaluation page. To celebrate the start of the competition in October, we decided to give away a £50 Amazon voucher – over three times the usual monthly draw of £15. I am pleased to announce that Mrs Hussain from Middlesex was the lucky name pulled from our prize draw, and apparently her voucher has already been spent! When contacted about the win, Mrs Hussain commented “Thank you very much. I received the £50 voucher today and have just bought something that I have wanted for some time! A friend of mine has a really good electrical hand held massager. But it was just too expensive. When I found out I’d won I knew that that’s what I’d be buying. I paid the difference and I’m so looking forward to receiving it. Hopefully it’ll help my chronic pain and I won’t need to have phsio so often. I’m sure friends and family will also be using the massager and so we’ll all benefit from the win! Having tried many holiday insurance companies over the years I have found Holidaysafe really quick and easy to book online. On top of that the rates are very good. All of this is particularly important for me as a family member has a pre-existing condition. Most companies seem to think that a customer having a pre-existing condition gives them a passport to charging extortionate fees. I would definitely recommend Holidaysafe to friends and family. If you’re interested in leaving us a review, or if you already have, then you could still be in with a chance of winning! 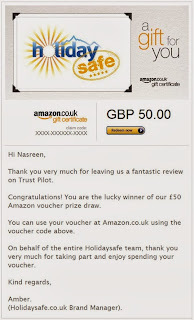 Every month going forward Holidaysafe are offering one reviewer the chance to win a £15 Amazon Voucher, all you need to do is leave us a quick review about your experiences with Holidaysafe via our Trust Pilot Evaluation page, and your name will automatically be added to the prize draw. Furthermore, if you’ve already left us a review, you could still be in with a chance of winning, because we aren’t going to remove any names from the draw (except winners of course) for the next five months, meaning that you still have five chances to win. For full competition terms and conditions, visit our original ‘Win with Holidaysafe’ blog post.